My Avid.com account still lists my plan as "Pro Tools | HD Annual Upgrade and Support Plan" as well. I renewed November 2017. My iLok asset did change to "Pro Tools Ultimate Perpetual Bundle" though. My iLok asset arrived today and I've downloaded the bundle and installed. All good, but no HEAT ?? Where is that supposed to be? Looks like my accounts have been updated also. Will download and install tomorrow. Let's know if HEAT was in your iLok account too ?? It's included in the comparison list.. 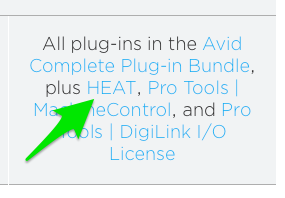 The current giveaway for Complete Plugin Bundle is a "gift" from Avid (a time limited gift); has nothing to do with that page which is referencing the Network Site Licenses which aren't out yet. Mmm, that's a little misleading. As we get everything else in that list. Enthusiastically sharing knowledge and experience at Stockholm Film School. Digilink I/O license is still a separate entity -- only get it with Avid interface purchase or grandfathered-in system. Otherwise you have to purchase (for instance, buying HDX cards and using with Symphony interfaces) separately. Network license (in essence site-wide licenses) won't have to. It was dumb of Avid to post that graphic when then don't even have Network licenses available. And for 99% of the people out there, network licenses are meaningless (unless you are running something like a post-production facility or educational institute.) But just a reminder: the Complete Bundle is time-limited gift; next year they don't have to hand out a renewal and people who became Avid Pro Tools subscribers after they announced it are not getting them. It's supposed to be a "thank you." If people aren't getting that, prepare to be "mislead" again next year. And just checked my account... not even giving a full year of Complete Plugin Bundle; just until your next 1-year upgrade subscription completes; for those of us with 3 years of subscription, for instance, this license ends in 6 months from the deposit date when the next upgrade subscription year starts and I got 3 of them that all expire on the same date. Hilariously I also have 3 more (total 6 licenses) licenses for the Complete Plugin Bundle but those expire when my current multiple renewals end because of a gift Avid were giving out at the end of last year if you renewed. Avid really haven't figured out this system. Last edited by BScout; 05-16-2018 at 07:36 PM.